Design of a re-themed experience for an existing ride. 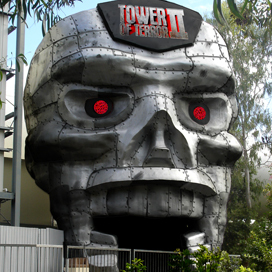 Dreamworld’s classic Tower of Terror ride was due for a major overhaul and they decided it was time to breath some new life into it. With the ride’s original manufacturer it was determined that a new ride car could be built that reversed the ride direction and Atomiq developed the new design. We then set about replacing much of the interior queue theming and enhancing whatever was to remain. As part of the the ride’s renewal the ride exit tunnel was extended 60m making the first park of the ride dark. Atomiq developed movement illusions for the tunnel using about 15000 LED lights. We also conceived steam effects, electrical arcing soundscapes, lighting sequences and spinning turbines as part of the queue line or launch sequences.